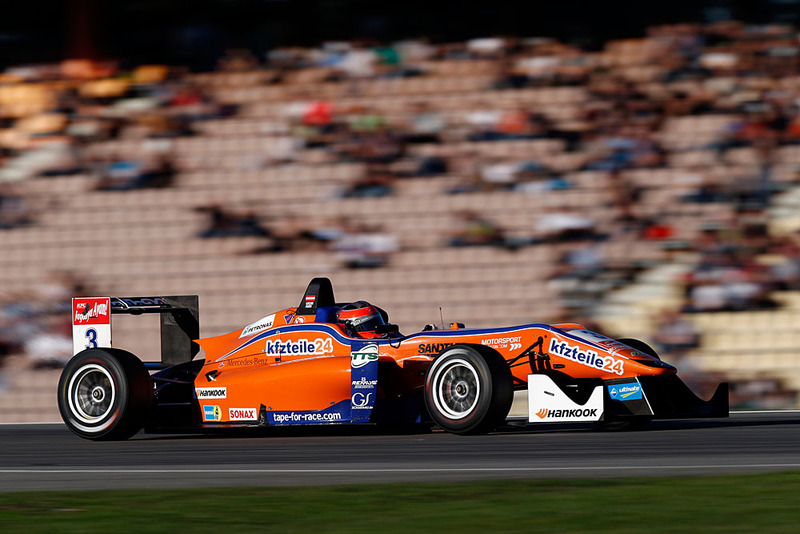 Lucas Auer won in Hockenheim. © FIA F3 Media Service. 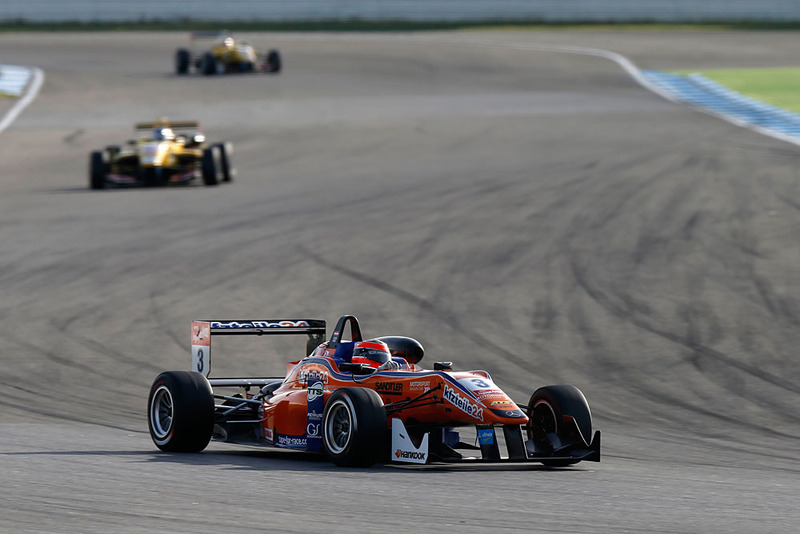 Lucas Auer claimed his third FIA European Formula 3 victory of the season at the Hockenheimring this morning. The Austrian took the lead on the opening lap after a wheel-to-wheel battle with Tom Blomqvist that lasted from turn one through to the Mercedes corner three-quarters of a lap later. The race was briefly halted by a safety car period when an overambitious Tatiana Calderon collided with Felix Serralles and Jules Szymkowiak at the hairpin on lap one. From the lap four restart, Auer pulled a 1.3s gap over Blomqvist and never looked threatened thereafter. By the halfway mark, the Mücke man had now drawn a two second advantage over Blomqvist; however with the 2nd place man coming under increasing pressure from Jordan King, Auer relaxed into a solid pace, bringing his Mercedes-powered machine home to a welcome victory, ending what has been a frustrating season. It proved a satisfying victory for Auer who once again suffered minor gearbox issues during the race, causing him to occasionally lose time in the middle sector of the lap. King eventually took 2nd place from Blomqvist three laps from the end when the Briton spotted a gap inside his Anglo-Kiwi teammate at the hairpin. Caught slightly unawares, Blomqvist failed to close the door, until King has forced his way down the inside, pushing Blomqvist down a position as a result. King had also driven a brilliant opening lap. Starting 5th, the Englishman pipped Antonio Giovinazzi into turn two, before making a decisive move on Felix Rosenqvist into Mercedes, just prior to the launch of the safety car. Although Blomqvist was disappointed to have lost the place to King, the Jagonya Ayam Carlin man had still done enough to solidify 2nd in the championship ahead of Max Verstappen. Rosenqvist enjoyed a tough battle with Giovinazzi to claim 4th place for Mücke. The Swede held his Italian rival at bay for much of the race, with Giovinazzi spending large portions of the contest close to Rosenqvist’s rear wing, but was rarely close enough to force a change of position. Giovinazzi did a have a go on lap 13, but on the one occasion that he needed to defend hard, Rosenqvist managed Giovinazzi to keep the Jagonya Ayam Carlin man behind. Verstappen, meanwhile, had another relatively quiet race in his van Amersfoort machine. From 7th on the grid, Verstappen took Esteban Ocon off the line, only for the Frenchman to retake Verstappen when the latter ran wide at the final corner come the restart after the safety car. Verstappen did look somewhat racey for a time – in his chase, the van Amersfoort man dived down the inside of Ocon at the hairpin on lap seven, as he tyre smoked his way into the corner; however Ocon immediately overlapped Verstappen, as the 17-year-old slid well wide. Thereafter Verstappen trailed the Rosenqvist / Giovinazzi / Ocon trio, but the Dutch teen passed Ocon again spectacularly at the entrance to Mercedes, when he sneaked down the inside of Ocon, briefly locking wheels with his target before passing. Ocon followed Verstappen hope, but this weekend the series champion and Prema Powerteam man rarely threatened the front and in this instance did nt look like breaking back into the top six. In the distance Sean Gelael finished 8th in his Jagonya Ayam Carlin entry, several seconds clear of Carlin stablemate Ed Jones (9th). Dennis van de Laar rounded out the points when he passed Jake Dennis on the final lap. Dennis had until then driven brilliantly to climb from last to 10th by the seventh tour, only to lose it when a mistake in sector one dropped him behind van de Laar. Beyond that, the race was run one lap shorter than scheduled when Gustavo Menezes’ smoking van Amersfoort machine caused the first start to be aborted. The American would then get a drive through penalty when he retook his position on the grid, when he was supposed to start from the pitlane. There was the usual fun and games at the back when Alexander Toril was hit by Roy Nissany on lap 15, before Nissany had a separate off of his own moments later. Auer’s victory ends a frustrating year for Mücke in F3. © FIA F3 Media Service.